If you or your business performs a service or gives professional advice for a fee, having an errors and omissions policy is a necessity. Commonly known as malpractice insurance for doctors and lawyers, or professional liability insurance for architects and accountants, E&O insurance protects against mistakes made in the course of doing business that lead to an outcome that is unacceptable or not agreed upon by both parties. If you are questioning whether or not your business needs to be protected from unhappy clients, chances are an E&O insurance policy is right for you. WHAT EXPENSES DOES E&O COVER? E&O policies are are “Claims Made” policies, not occurrence policies. This means insurance will indemnify the involved parties regardless of when the error occurred. An errors and omissions policy covers all defense costs in the event of a lawsuit up to the policy limit. Defense costs include legal fees, settlements, judgements, and sometimes punitive damages. There is no “one size fits all” policy for all businesses- each agreement is crafted to protect your business and the integrity of its professionals. WHAT CLAIMS DOES IT COVER? ECBM’s on-site Claims Department argues for coverage on your behalf in the event of a claim. Unlike most brokers who pass their clients off to their insurance carriers to fend for themselves, we see the claim through until a check is in your hand. A member of our claims department will be your point of contact during the claims handling process, acting as your advocate so that you can focus on running your business. 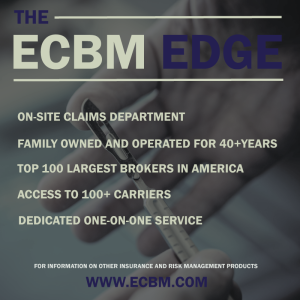 At ECBM you’re not just a policy number, and our commitment to our clients is why ECBM has an over 95% retention rate, compared to the industry average of approximately 80%.